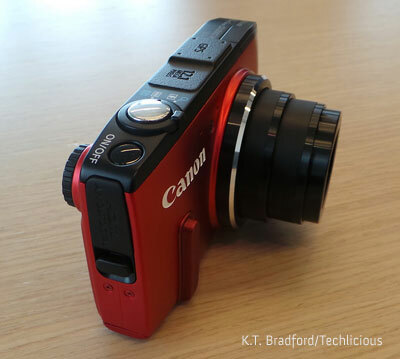 Canon's new PowerShot SX280 HS is a powerful megazoom camera in a slim and compact body. It retains a lot from last year's popular SX260 HS ($299.99 on canonusa.com, $213.99 on Amazon ), but that's not a knock. After all, the last generation was a pretty sweet camera, and this year's model looks to be even better. What the PowerShot SX280 HS retains is the 12.1MP CMOS sensor and 20x zoom lens (25-500mmm equivalent), as well as the ultra-compact body and well-designed dials and interface of the SX260 HS. In fact, the camera is slim enough to fit in most pockets (sorry skinny jeans wearers, not you). New features for the PowerShot SX280 HS include GPS and Wi-Fi, but most of the improvements are on the inside. Canon upgraded the image processor to DIGIC 6, which increases performance and makes for crisper, more balanced images, even in challenging lighting. Now images have lower noise at higher ISOs, so you don't have to compromise on speed. Plus, the camera is overall faster, ready to shoot in just a few seconds, and capable of 14 frames per second in burst shooting mode. Quibbles: I noticed that the autofocus isn't as snappy as I'd like, and macro shots weren't easy to get in Auto mode. Video capture has improved. Now you can shoot at 60 or 30 fps when capturing 1080p HD video in MP4 format. Overall, the PowerShot SX280 HS is pretty powerful for such a small camera. Available in April for $329.99.